So the pricing via this website is ENTIRELY different than what's on the actual truck. On this site, the bean burrito is $6. On the truck, it has a lot of burritos listed and the closest I could find was a spinach one for $8.50, the cheapest burrito on the menu. Frustrating since I brought cash...or almost enough cash. BOO! Response: Kyle\'s note: this is my fault for not updating the menu soon enough. It does not appear that a bean burrito option exists anymore. I was very impressed with the Burrito. The truck itself is not pretty, but who cares . . . the food is Delicious. It was a good sized burrito and the hot size had a nice kick to it! THIS IS MY FIRST TIME COMING TO THIS TRUCK, WHICH WAS FORCED BECAUSE TSR RAN OUT OF GUACAMOLE. I ORDERED THE CHIPS AND GUAC AND HANDED THE MAN TAKING MY ORDER MY DEBIT CARD; HE RUDELY SNARLS "YOU DON'T HAVE CASH?!!" "NO." I REPLIED, OTHERWISE I'D BE USING IT. I WAS #47 AND THEY WERE ONLY AT #40, I ORDERED CHIPS AND GUACAMOLE!! I SHOULDN'T HAVE TO WAIT FOR PEOPLE ORDERING 12 BURRITOS PER PERSON! I WAITED FOR ABOUT 20 MINUTES IN THE SCORCHING HEAT, WHEN I FINALLY HEARD MY NUMBER BEING CALLED "#47!! !, 47!!" I RUSHED OVER TO THE WINDOW, AND GLANCED DOWN AT THIS TEASPOON OF "GUAC" SITTING ON A LARGE BED OF FLAVORLESS PITA CHIPS. I WAS FUMING ON MY WAY TO WORK TRYING TO ARTICULATE IN MY HEAD WHAT KIND OF REVIEW I WOULD POST (AND I NEVER WRITE REVIEWS!!!) I GOT TO WORK AND TASTED THE "GUAC" AND IT WAS NOTHING MORE THAN MASHED UP HOT AVOCADO!! I'M EXTREMELY DISAPPOINTED, AND WILL NEVER RECOMMEND THIS TRUCK! FYI: I ONLY GAVE IT A 1 BECAUSE YOU HAD TO RATE IT!! OTHERWISE IT WOULD GET A -100 STARS!!! I have passed by this truck many times but decided to try them out today. All the tacos were good, traditional style, but the tacos al pastor might be my new favorite food! I ordered them "hot" and took a little mild green tomatillo sauce with me to add. I will definitely be back! Plenty of delicious chicken, fresh cilantro and onions, and a fat slice of avocado was in each taco. I was only going to eat 2 of them but I couldn't stop! The spicy sauce was indeed hot, but not nearly so much that my face melted off or anything. The black beans and rice were a nice and tasty addition. And it's healthy too! I'll be watching for this truck again for sure. With a nice thick slice of avocado included with the tacos, they were absolutely delicious. Some of the best soft-shell tacos I've ever had. Adding the rice/beans/cheese that came with the meal into the tacos made them superb. Nice big burrito. Lots of flavor. 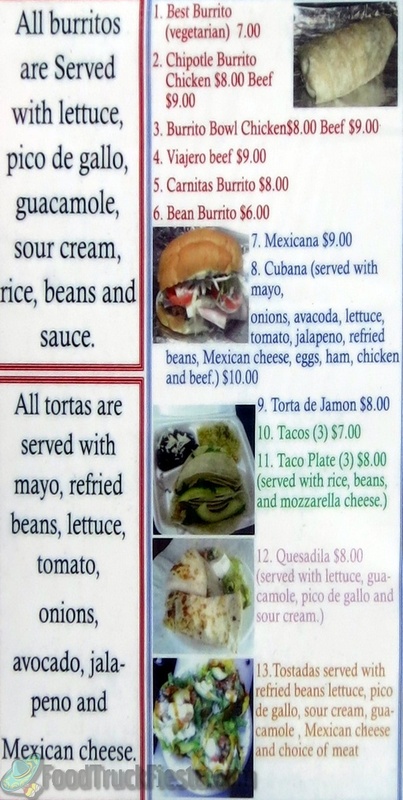 I hope they come back to Patriots Plaza so I can try the Torta. GREAT TRUCK! I have avoided it for a while because I was not impressed with any of the other taco trucks around...boy was that a mistake! Authentic tacos cooked to order and delicious. Several meats to choose from. I can't believe people would actually complain on here that it takes too long. Taht's the problem with the other trucks pre-made food is terrible. I'd wait a while for this truck for sure. Authentic, fresh and light. These are what Mexicans call tacos -- soft corn tortillas, some grilled chicken, onions and cilantro, hot sauce, avocado and lime to squirt on it. Comes with black beans and rice. If you are expecting the greasy, cheese and sour cream laden American taco, you will be disappointed. My only complaint is that "hot" here is not very spicy at all. Other than that, it's an excellent value as food trucks go. Aug 02, 2013 by JBurrito! Very nice personnel but it was weird to have green beans, carrots and broccoli (all overcooked with that grade school lunch squishy texture)in my burrito. I expected lots of peppers, onions and cheese. I would possibly try a meat entre here but no more veggie stuff. Where else would they even use green beans on their menu? Best Mexican Burritos and Tortas started serving on July 10, 2011. 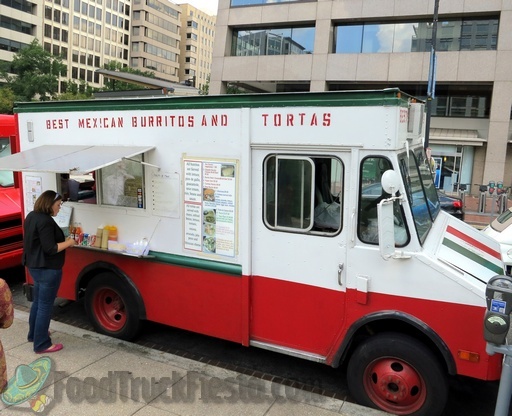 Their truck was retired and replaced with DC Latino Grill Platter, which is now what is tweeted from this account.